The Boards “may have dropped the ball in making sure the peer review process is working properly,” NASBA Compliance Assurance Committee Chair Kenneth R. Odom (AL) told the Eastern Regional Meeting. At the Western Regional Meeting, Committee member Edwin G. Jolicouer (WA) noted, “There is no outside independent oversight of the National Peer Review Committee. We think it could be tweaked and improved.” Alicia J. 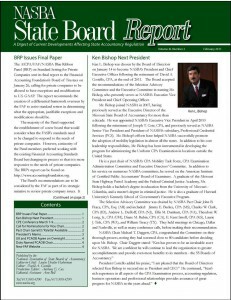 Foster (MD) and Robert G. Zunich (OH), both former State Board members, have been appointed to the NPRC, Mr. Odom reported. Less than 20 Boards now have peer review oversight committees, although Chapter 3 of the AICPA’s Peer Review Manual outlines how a Board can set up such a committee. Roughly 10,000 firms are being reviewed each year, and some 92 percent of them over the last three years received an “unmodified” report, Mr. Odom said. “If you had to justify the peer review system to the media in your state, I think you would be hard pressed to convince the public that you are providing oversight and you are confident that the system is working as it should,” Mr. Odom said. “You would be telling people that you are relying on someone else for this.” He urged all Boards to establish oversight in their states. Mr. Jolicoeur, who presented the Compliance Assurance Committee’s update two weeks after Mr. Odom, said in the intervening period the Committee had met with AICPA staff and progress on oversight of the NPRC is being made. He encouraged the Boards to make sure their system is working: “Trust but verify,” he said.